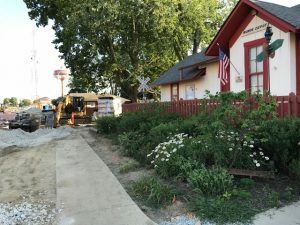 The Board of Directors of the Carmel Clay Historical Society has decided to close the Monon Depot and the Archives building for the next several weeks while construction on the Monon Boulevard expansion takes place directly in front of the Historical Society’s property. This action also means that a planned summer exhibit on the history of WHJE Radio, the Carmel High School radio station, will be postponed until this fall or next spring. However, the upcoming Remembering Dale Graham program on September 27 at Carmel High School is still scheduled and tickets are available for that event, co-hosted by the Carmel Education Foundation. Visit us on Facebook or our website. The Board of Directors regrets any inconvenience this causes to our members and to the public, but this is temporary and we will continue to monitor the situation and reopen just as soon as possible. « Holiday Home Tour Tickets – NOW ON SALE! © 2011. WEBSITE DESIGN BY SILVER SQUARE INC.